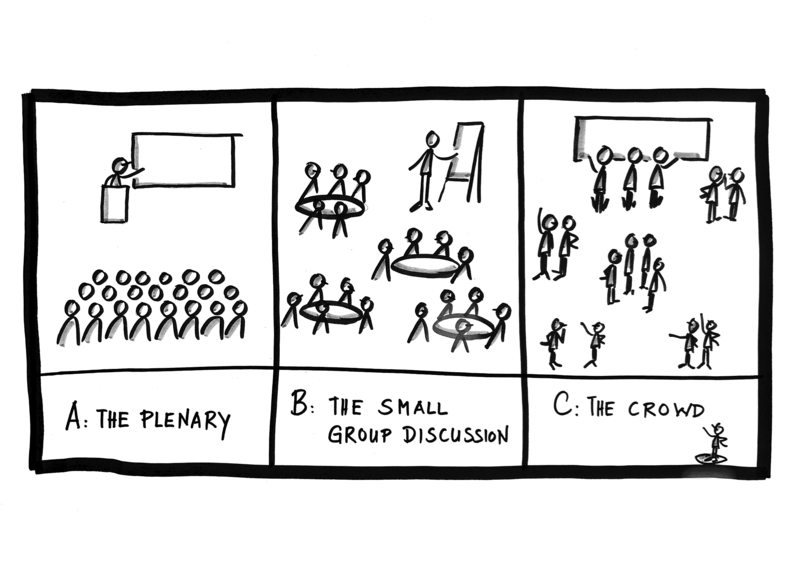 These drawings represent some typical situations in learning events. Which of the three situations do you prefer: A, B or C? In his blog post What sort of network is your meeting? Johnnie Moore compared these three workshop situations with networks. A: The plenary mindset can be characterised as a centralized network where experts give inputs; in this mindset the workshop follows the pattern of ‘input + Q&A + plenary discussion’. B: The small group discussion can be seen as a decentralized network where discussion and reporting back to the plenary are clearly structured, timed and guided. C: The crowd resembles a distributed network, people are in the driver seat, they have authority over their learning process. By comparing workshops with networks, Johnnie Moore is holding a mirror under our facilitators’ nose. How we organise learning events, workshops, conferences and trainings is a choice. Our choice is informed by our mindset, our basic beliefs, our experiences and knowledge. As human beings we tend to do what we know, are familiar and comfortable with. And hence, we stick to old patterns, repeat and limit ourselves. So, honestly, in which mindset are you when you plan a workshop: A, B or C? So, let’s challenge ourselves. We need more C! The centralized plenary mindset is hardly helpful in a networked world where information is available and accessible. The questions and challenges treated in learning events are of complex nature. Lecturing won’t change much; we need to generate new knowledge together. In a more rapidly changing world, the most powerful form of learning is creation of new knowledge. We have to give people, groups and teams time and space to reflect and think together, to be in conversation with each other to dive into an issue, to probe and sense and generate ideas for solutions. What people create together depends very much on how they are in conversation. We have to shift the small group discussions to open conversation and dialogue. For further food for thought on deep and meaningful conversation dive into the thinking of Peter Block, Peter Senge, David Gurteen, David Bohm, William Isaacs and many more. As with any complex living system, when a group of people comes together, we cannot always know what it is that they will create. The whole is greater than the sum of the parts. Vying for the predictable means short-changing ourselves of new possibilities. Ian Pinsloo wrote an interesting blog post about Relationship as the Medium for Creating Change. In his experience, relationship building is a means of the facilitators’ work. As facilitators we assist groups to build quality relationships so that they can have the conversation they need to have. Without productive, high-trust connections, people and groups can’t make progress on their shared goals. 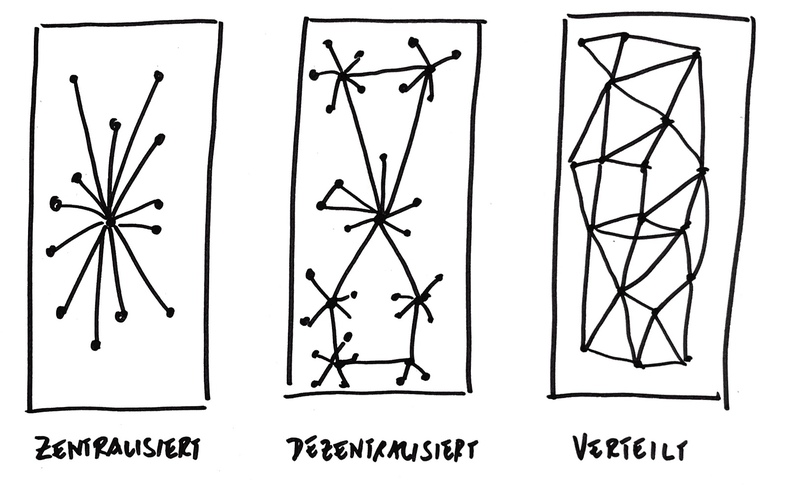 To me it is evident that we need more distributed network thinking in workshop planning to unleash a culture of collaboration, cooperation and joint learning. A great thank you to Johnnie Moore for the inspiration.